What’s a beach vacation without great food? If you’re making Siesta Key in Florida your vacation destination, you’ll be delighted to know that there’s no shortage of fabulous foods on this island. Second perhaps only to the pure white sand beaches is the selection of Siesta Key restaurants where you can enjoy mouthwatering dinners after a day in the sun. A top choice is the Siesta Key Oyster Bar, or simply SKOB. Have a drink at the indoor or outdoor bar, or perhaps dine indoors or on the back patio. No matter where you choose to sit, the food is going to be outstanding, the atmosphere causal, the surroundings unique. Take a look at the dining menu and more to see what makes SKOB one of the top Siesta Key restaurants on this island. What better way to start off your dining experience than with an enticing appetizer…or, as they’re locally called, Skobetizers! From crab cakes and grouper bites to chili-crusted tuna and Cajun-dusted popcorn crawfish, there’s something for everyone on the menu. And let’s not forget those award-winning wings, or what SKOB is most well-known for: specialty baked oysters, Canadian mussels or Cedar Key clams as well as a daily oyster special. So go ahead and pick an appetizer (or two), some oysters and a salad, or one of SKOB’s hard-to-pass-up flatbreads, but leave room for the dining yet to come. 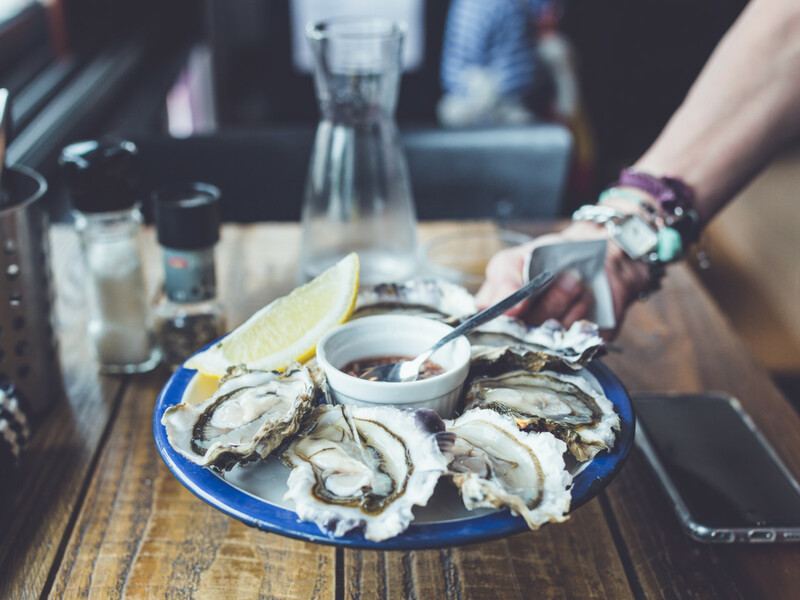 The only problem you’ll find with Siesta Key Oyster Bar is that there’s so many great dishes to choose from, it’s hard to make a selection. You’ll also find an impressive range of options for side dishes to accompany your entrees such as corn, slaw, fries, green beans, potatoes, broccoli, grilled asparagus, edamame, Caesar salad, onion rings, sweet potato fries, and other seasonal fresh local vegetables. There’s also a large choice of “SKOB Classics” which are signature entrees that you won’t get to try elsewhere such as the SKOB’s version of seafood paella, the Big Boil which includes crawfish, shrimp, mussels and crab legs boiled in Louisiana style with corn and potatoes, the Siesta Key Extravaganza with blackened grouper, jerked shrimp and crab cake, SKOB’s own Big Boy Mac n’ Cheese, shrimp and scallops, beer battered fish n’ chips, seafood tacos, ribeye, and crab stuffed lobster. The Caribbean Mariscada is a standout from the SKOB menu and a chef special: sautéed shellfish and fish in a light fish fumet with coconut spiced rum! Or you can select from other entrees that include crab legs, shrimp, pork chops, lobster tail, scallops or seafood or catfish tacos. There’s also burgers, sandwiches (called, of course, Skobwiches!) and premium sides. It’s certainly an impressive menu for an oyster bar. Most importantly you will always get attentive and professional service with great food quality no matter when you visit or what you order here. The menu is reasonably priced and you’ll always feel welcomed by the warm and friendly staff and regulars. While you’re there, be prepared for some great live music at Siesta Key Oyster Bar! All week long, local talents appear at this venue to make sure your visit is a rocking good time. Both single players and bands take to the stage from Sunday through Saturday. And Tuesday is Open Mic Night — come and make your debut! Are you ready for some football? On football Sundays, enjoy a cold draft beer and game day specials. Finally, it’s safe to say that other Siesta Key restaurants do not have dollar bills papering the ceilings and walls: a truly unique look that always makes an impression on visitors. While you’re there, check out the happy hour specials on the raw bar and drinks! Hours are from 11 a.m. to midnight Monday – Thursday and 11 a.m. to 2 a.m. on Friday and Saturday. SKOB is also open for Sunday breakfast at 9 a.m. to 11:45 a.m. and stays open until midnight serving its regular menu and drinks. It is located at 5238 Ocean Boulevard in Siesta Village. Stop in for a drink or meal to see why many have rated SKOB as their favorite nightlife destination and Siesta Key Village restaurant! You’ll find this truly unique dining experience in the heart of Siesta Key Village within walking distance to your Tropical Breeze Resort hotel room. Don’t let your stay on this beautiful island go past without at least one stop at Siesta Key Oyster Bar. Chances are you’ll want to stop by more than once. We bet the whole ceiling on it!